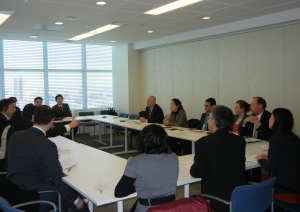 (New York) On Tuesday 18 March 2014, staff of the UN Office for Disarmament Affairs (UNODA) met with youth representatives of Soka Gakkai Japan and of SGI-USA working in the field of nuclear disarmament. 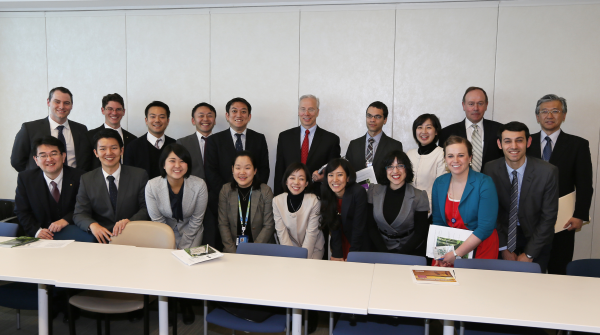 Ten youth representatives from Japan and seven from the United States visited the UNODA for the first time to engage in a dialogue about nuclear disarmament. Soka Gakkai International (SGI), a lay Buddhist organization with 12 million members in 192 countries and territories, has been in consultative status with the UN Economic and Social Council since 1983. As an NGO working with the United Nations, SGI has been active in public education with a focus mainly on peace and disarmament, human rights and sustainable development. The group from Japan made a brief activity report on its initiative, SOKA Global Action, promoting grassroots level support for nuclear disarmament. They organized a forum where a small number of people could engage in dialogue with hibakusha, victims of the atomic bombings of Hiroshima and Nagasaki. Also, they conducted a survey from December 2012 through February 2013 of 2840 youth from nine countries in order to assess current awareness towards nuclear weapons and to identify an effective strategy toward their abolition. The representatives from the United States reported on their youth-led initiative, the New Clear Future initiative, facilitating dialogue among peers to raise awareness of nuclear weapons issues. UNODA and the Soka Gakkai representatives also exchanged views regarding SGI’s future plans and ideas so that SGI and other civil society organizations can effectively work with the United Nations to support nuclear disarmament. UNODA was very supported of a number of suggested ideas as a means of raising more awareness of nuclear weapons and enhancing disarmament education. Soka Gakkai Japan is planning to organize a youth summit in Hiroshima and Nagasaki in 2015, which marks the 70th anniversary of atomic bombings of Hiroshima and Nagasaki, where people from different countries and religions can get together to discuss nuclear disarmament and enhance awareness towards nuclear abolition.